Getting divorced can be a highly traumatic event, even if your divorce was amicable it can be overwhelming to try to figure out a new norm for you and your kids. Once you’ve become a single mom it’s up to you to create a new lifestyle and routine for the kids and yourself. 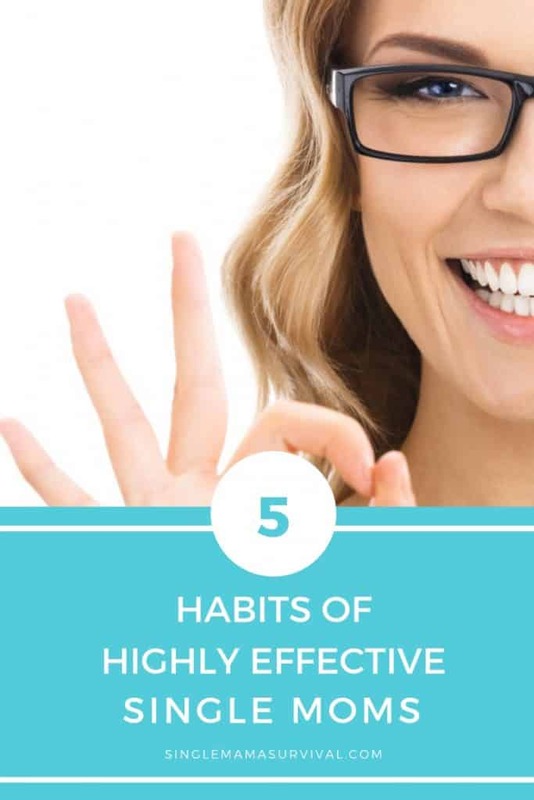 Today I’m featuring the top five habits of highly effective single moms so that you can rock this single mom title without much stress. The most effective single moms around have a support system in place. They’re able to use counseling or local parenting groups to assist in guidance during their days of being a single mom. Avoid the ego that will tell you it’s weak to ask for help, listen to your heart and friends will be there to guide you forward during this transition and each time you happen upon a bump in the road during single mom life. Highly effective single moms have let go of any anger towards their co-parent and have learned to develop a higher level of understanding. Now that you’re parenting in two separate households you’ll find that issues arise with conflict in parental decisions between homes. As time goes on you’ll work to try to understand why your partner parents the way they do and instead of bashing them, you’ll simply explain to the kids that Mom and Dad have different rules. Now that you’re a single mom, the vision that once existed during married life no longer exists. It’s time to sit down and create a positive vision that details your future goals and dreams as a single mom. This will give you something to work towards every day and look forward to in the future. Creating a new positive vision can be as simple as jotting down your ideas or creating a vision board to keep your eyes on the end goal. In order to fully be effective as a single mom, your cup has to be full. This means it’s important that you build in alone time during your daily schedule to recoup from the madness that can ensue when you’re raising kids alone. ALone time could be a bath at the end of the day, curling up to a good book for an hour, or simply sitting alone in the dark with your thoughts after the kids go to sleep. Just be sure you schedule alone time on a regular basis to rejuvenate yourself. Lastly, you’re number one job is to raise your kids to the best of your ability. Remember that your kids are probably having their own issues being raised by a single mom and it’s important that they get to maintain some part of childhood during this process. Make time to play with your kids. This could be cooking in the kitchen, playing pretend play, video games or anything that your kids enjoy doing. Enjoying activities with your kids will spark happiness in your home. Making the transition from married life to single motherhood won’t be easy. You’ll experience many bumps along the way until you figure out a way that single motherhood will work for you. Each of the habits I shared today are what highly effective single moms have used to stay happy and healthy during this new phase in parenthood.